Bullying has devastating effects to everyone involved. If you are a teen being bullied, know that you are not alone. If you are a teen who is bullying, there are resources to help you stop. Parents, if you are worried that your teen may be bullied or is the bully, there are warning signs to look out for as well as things you can do to help your child. Bullying is repeated, persistent, and aggressive behaviour directed at an individual or individuals that is intended to cause fear and distress and/or harm to another person’s body, feelings, self-esteem, or reputation. Bullying is not something that anyone should have to deal with. ELECTRONIC (commonly known as cyberbullying) – spreading rumours and hurtful comments through the use of e-mail, social media websites and text messaging. If you are being bullied there are always 4 numbers you can call where people will care, provide support and take your concerns seriously. Everyone who is being bullied has a different experience. If you’re being bullied, here are some things you might feel; fear, guilt, anger, shame, sadness and pain. Many young people who are being bullied feel trapped and scared. You might find yourself imagining future episodes of bullying. You might find yourself wondering what you did to provoke the bullying, and feeling bad about it. Whatever you have done in the past, you don’t deserve to be bullied. It’s not your fault. You might think a lot about how you can fight back, or get revenge on the person who is bullying you. Being angry is a natural response to bullying, but know that aggression and violence are not the right answer. You might be embarrassed or ashamed that this is happening to you, which can make you want to keep the bullying a secret. Try to remember that being bullied doesn’t make you weak, and reaching out for help is a sign of strength and courage. Bullying can make a lot of people sad. Sadness is a normal response to being hurt, and bullying is very hurtful. Being bullied – even if no one’s hurting you physically – can really hurt. In fact, emotional pain can last longer than physical pain. If you’re experiencing bullying, you might also find that you’re more sensitive to other kinds of pain, or that you get more stomach aches or headaches than usual. So What Can You Do If You Are Being Bullied? REPORT IT! Reporting bullying isn’t tattling – it’s self-protection and it’s your right. Check your school’s anti-bullying policy to learn the process for reporting bullying (ask your Principal, VP, or any staff in the Main Office to see a copy). If you don’t want to report the bullying directly to your school or the police, try to think of an adult you trust, such as a parent or teacher, who can help you feel supported and give you advice. If the first person you talk to isn’t helpful, tell someone else. Don’t give up! It sometimes takes a few tries before you find someone who knows how to help. Keeping a record of bullying incidents, saving harassing texts, and taking a screen shot of abusive posts can help your case if you do decide to tell an authority about the bullying. Contact the police if you are being physically threatened or feel that your safety is in danger. Get support, having people around that you can count on can help you feel better while you are dealing with bullying. Try opening up to people you trust about what you are going through, and don’t be afraid to ask them for help. Stay safe, Staying physically and emotionally safe is the most important thing to do while you are dealing with bullying. Ask yourself: How can I stay safe while I’m around the person who is bullying me? You might want to walk with a friend to school, avoid certain routes around your neighbourhood, or temporarily close your Facebook account. 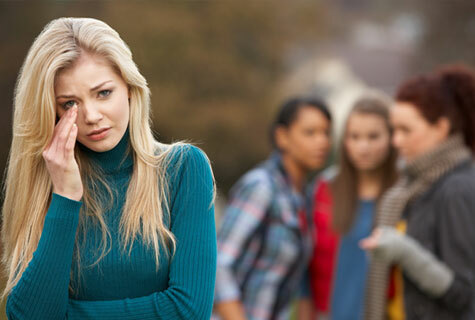 If you feel embarrassed to let your friends know you are being bullied, try to keep in mind that most young people disapprove of bullying behaviour, and will most likely be on your side.If you need help coming up with a safety plan, you can always contact Kids Help Phone at 1-800-668-6868 or if you just need someone to talk to call the Distress Centre at 519-256-5000.Take care of yourself. It can be stressful going through bullying, so try to be kind to yourself. Eating balanced meals, getting enough sleep, and staying active and social can help keep you healthy as you go through this difficult time. Writing about how you’re feeling in a journal can improve your mood and help you find solutions to your situation. Sometimes bullies don’t know that they are bullying and hurting others. There are different kinds of bullying, from physical bullying (hitting, shoving, and so on) to verbal and emotional bullying (calling names, teasing, or excluding someone) to Cyberbullying. Sometimes, verbal bullying can have the most serious effects. All bullying is wrong. It’s never OK. It is everyone’s right to be treated with respect and to feel safe. Just because you don’t like someone doesn’t mean it’s alright to abuse or harass them. The Effects of bullying include depression, hopelessness, anxiety, and school and relationship problems. Many times, people bully someone who has bullied them first, or who they think deserves it in some way. But no matter what someone has done to you, it’s never OK to try to hurt them on purpose. Just acknowledging that you have a problem is the first step towards taking responsibility and changing your behavior. You can change! Lots of people who bully others learn how to behave differently, and have healthy friendships with other people. A lot of bullying occurs in group situations, where three or more people bully one or two others. Sometimes, you might be involved in group bullying without really knowing who started it, or why you’re doing it. You might be following someone else’s lead, or you might find it just “happens” when a certain group is together. If you’re involved in group bullying, and want to stop, good for you! The next time your group is bullying others, try walking away, or telling the others to stop. You can also try talking to others in the group once the bullying episode is over. Explain you don’t want to be involved anymore, and tell them that the next time it happens, you’ll take a stand. Are You Ready To Stop Bullying? Signs Your Child May Be a Bully? Likes pushing around and teasing other children. Is a smooth talker in tough situations. Make it clear to your child that you take bullying seriously and that you will not tolerate this behavior. Talk to her about role-reversal: “how would it feel if you were the one being bullied?” This is a conversation you may need to have more than once. Develop clear and consistent rules within your family for your children’s behavior. Require him/her to apologize to the child he bullied-either verbally, in a letter (or sometimes both). Continue to follow-up to make sure that the bullying has stopped. This means staying in touch with the school or with the bullied child’s parent. This is the hardest, but most important part. It shows your child that you take his behavior seriously and that bullying is unacceptable in your family. Tell your child that if the bullying continues, there will be a serious consequence-mean it, and follow through! Spend more time with your child and carefully supervise and monitor his or her activities. Find out who your child’s friends are, and how and where they spend free time. Build on your child’s talents by encouraging him or her to get involved in pro-social activities (such as clubs, music lessons, non-violent sports). Share your concerns with your child’s teacher, counselor, and/or principal. Work together to send clear messages to your child that the bullying must stop. If you and/or your child need additional help, talk with a school counselor and/or mental health professional.